This week I’ve decided to stick with last Friday’s theme: spring. By now, most of you have thawed out thanks to consistent temperatures above 32 degrees. And some of you may have even played in the garden, driven with the windows down or taken a stroll with *gasp* short sleeves. Yep. Spring has finally sprung. To supplement your current stockpile of spring and summer appropriate hairdos, I’ve curated a post on warm weather-inspired styles. Most have an air of romance about them, making them ideal to wear at prom, weddings or other formal formal events, afternoon tea parties (feel free to substitute wine spritzers) or evening shindigs with your besties. This “Summer Nights” hair tutorial comes to you from blogger Kinsey Mhire of Sincerely, Kinsey. You can wear this one with or without the flowers, just make sure you keep the braid soft and slightly unkempt to keep it softer and more romantic-looking. P.S. I highly recommend browsing through Kinsey’s blog, which features stunning photography by her and her husband and uber pretty hairstyles such as the one featured here. As someone who prefers wearing my hair down, I love this hairstyle by retro blogger Violet LeBeaux. It creates the illusion that your hair is still down in the front, but it’s actually “up” in the back, keeping hair off your neck. In other words, it’s perfect for particularly warm days. By the way, you don’t have to have cotton-candy dipped locks or a floral hair pin to re-create this look. It’ll look pretty no matter what. Here’s another one that keeps the hair off your neck, but it goes one step further by getting hair completely out of the way. I think it’s ideal for errand running or days when you don’t want to keep pushing hair out of your face. YouTube user BluffedStyle recommends this style for women with extra long hair and she uses a hair donut sponge to create an even fuller look. You can add accessories, such as a head wrap or pin, to stylize the look further. Here’s another dreamy hairstyle to add to your tutorial arsenal. It comes to you from Amanda Paige, who runs a blog dedicated to hair and makeup tutorials. 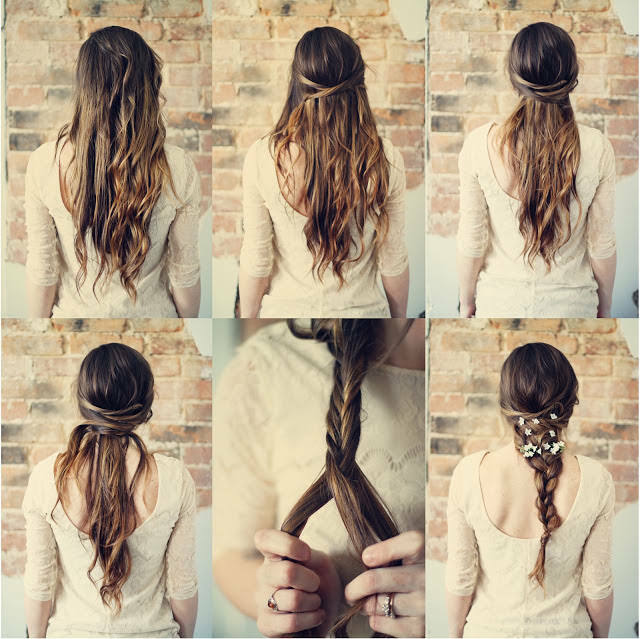 This style works on both medium and long hair. 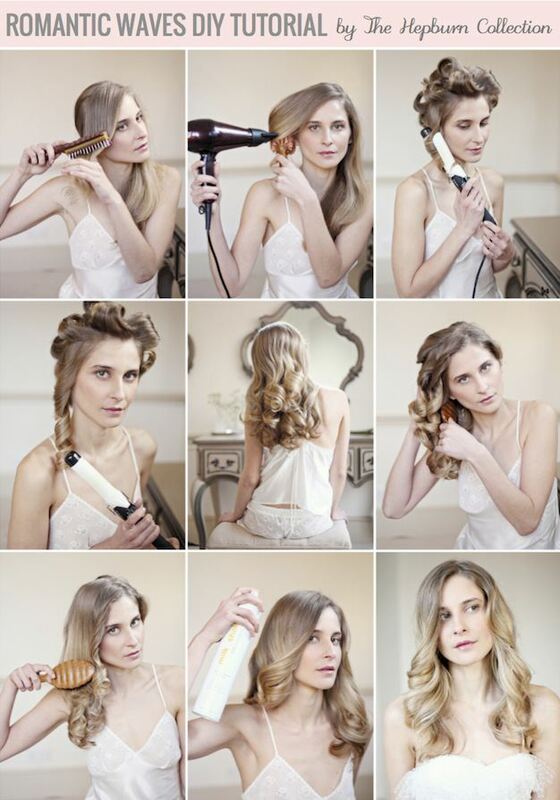 You start by curling your locks to add texture. Next, sweep hair back, rolling it as you do, and pin at the crown. Amanda added some golden leaf embellishments, which I love. She created them by spray painting actual leaves gold. Here’s another ultra romantic ‘do for you to try during the warm season. This one’s brought to you by Bridal Musings via “The Hepburn Collection.” The style may require some additional time and finesse, but the drop dead gorgeous end result is absolutely worth your effort. You’ll need curlers to create big waves, a curling iron to create tighter curls and a generous application of medium-hold hairspray and/or gloss spray to make your hair look especially healthy and shiny. May I suggest you wear this one to a wedding (whether you’re the bride, a bridesmaid or guest). If you love these romantic looks, then you’ll love this sweet summer romance-inspired updo too!